In the first video, we are going to solve rational equations by getting the LCD (Least Common Denominator). Let’s go over how to solve rational equations. In this method, we’re going to do it by getting the least common denominator (LCD). First, let’s examine the denominators here. One way to get the least common denominator is to multiply them together. We want to examine these denominators so we can tell the factors. stays the same as well as . But can be factored out into . This denominator is the first one times the last one. Which makes this the least common denominator. At this point, we can drop the denominators. Since we already have common denominators, we can just add the numerators. So, what’s really important is that we have a common denominator so we can add the numerators. Here, we can find the value of . 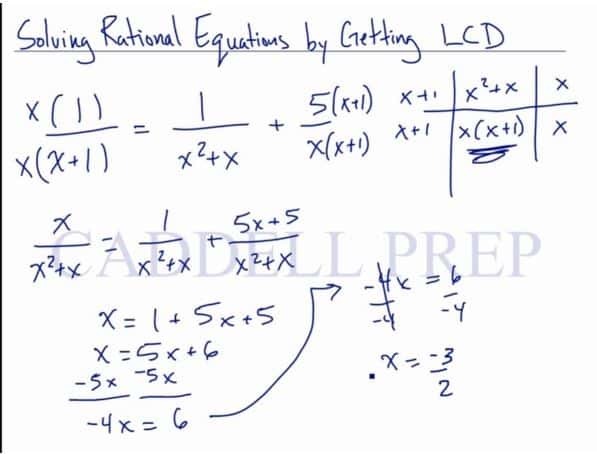 In the second video, we are going to solve rational equations by multiplying by the LCD (Least Common Denominator). 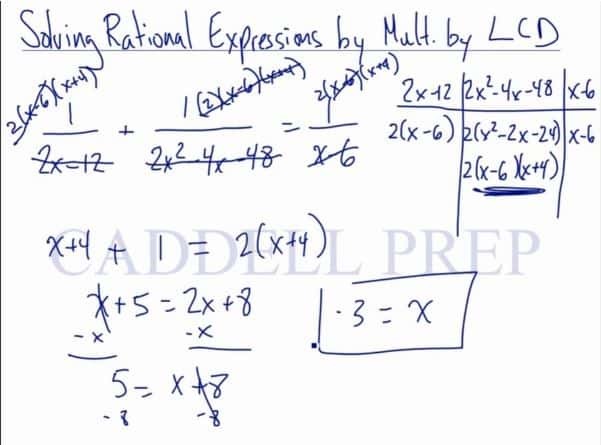 Let’s go over solving rational expressions by multiplying by the least common denominator. First, let’s look at the denominators. We’ll get the common denominator by multiplying these together. For us to get the least common denominator, let’s factor and see what we’ll end up with. factored is and can still be reduced as . The second factored denominator is the least common denominator. Instead of having the same denominator, we’ll just multiply each term by the least common denominator so we can cancel out later on. When multiplied, the equation remains the same since we didn’t do anything mathematically incorrect. What we’ll do now is reduce. At this point, we have no more denominators. Now, we have a simpler equation we can solve. Let’s combine like terms on the left side and distribute on the right side of the equation. Now, let’s get all the -es together. This is our final answer. Another note for this is to always check our answer. If we put the value of , we have to make sure that the value of the denominator does not equal to zero. Because if the denominator is zero, that’s undefined. 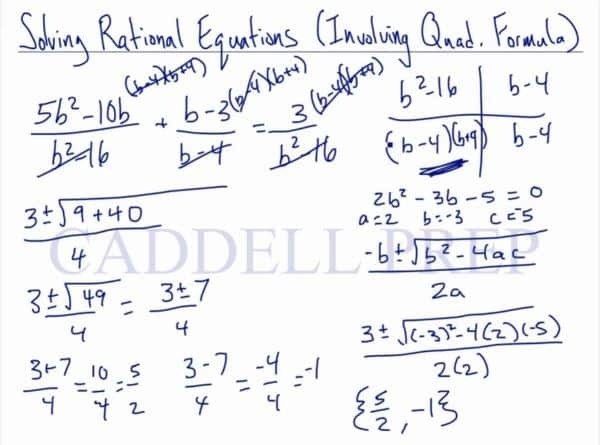 In the third video, we are going to solve rational equations by using the quadratic formula. Let’s go over solving rational equations involving quadratic formula. What we want is the common denominator. Or we’ll use a different method that can get rid of the denominators. Let’s first examine the denominators. You can choose to multiply the second expression by to have a common denominator. Or multiply everything by the least common denominator then cancel the denominator out. Let me multiply everything by the least common denominator. This is just my preferred method. But either methods will work. Make sure to put the parenthesis there. You may be confused and only distribute when you have to distribute the whole thing. Now, let’s first distribute the ones in the parenthesis. Then let’s combine the like terms. Here, we have a quadratic. So let’s get one side equal to zero. We can do a number of ways to factor this. But let me jump straight into using quadratic formula. Now, let’s substitute these values in. So we have two different answers. Of course we have to check our answers. Just to make sure that when we plug the values in, we won’t get zero in the denominator. Just a quick look at the denominators, with our answers, plugged in. Both of these should work out.